I have been making bread with sourdough, or natural, starter for a few years now but since things have been so crazy the past year or so I have not posted much about it. There are several recipes that I make frequently and it is past time that I shared them with you. I will start with one of the first recipes I tried. I wanted to find something to replace this whole wheat sandwich bread that was my standby bread, and I was looking for something that looked straightforward and not too threatening for my first attempt. I found this article on sourdough written by an Austin (now Denver, apparently) gamer. It has really good information (and the FAQ page, while closed, is super helpful as well). The recipe seemed straightforward enough and similar to my whole wheat bread recipe so I did not feel quite as intimidated as I might have felt had I decided to tackle San Francisco sourdough or some other more artisanal-style loaf. The result was quite tasty, and this became my weekly bread for a while, until I got comfortable enough with the sourdough to start to branch out and try other recipes. Although I now make many different sourdough breads I will still make this one when I am in the mood for peanut butter sandwiches for lunches and toast for breakfast. 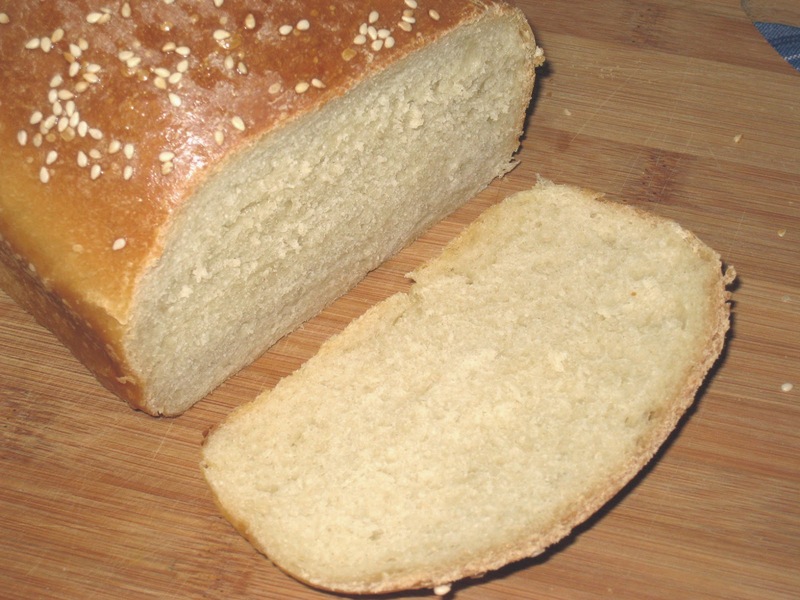 The crumb is soft but holds up to spreads and toasting. It is an all-around versatile thing of beauty and will get you lots of compliments. In the original recipe he does not preheat the oven; instead he turns the oven on and then puts in the bread and cooks it 15 minutes to half an hour longer. He makes a good case for why it should be done that way and I did do it that way a couple of times but old habits die hard and I found myself preheating the oven about half an hour before baking time without even thinking about it. Either way will work just fine. The only problem I currently have with my sourdough is that I do not care for the way it interacts with whole wheat flour. I can't even pinpoint exactly what the issue is for me but I find myself using regular bread flour much more often with my sourdough breads although I would much prefer to work with whole wheat. Through experimentation I found that adding 1 cup of whole wheat flour to the recipe was the perfect combination for both flavor and texture (texture being my main issue with sourdough and whole wheat) for me. You may not have the same issues with it as I do, so feel free to substitute as much or as little whole wheat flour for the bread flour as you would like. The ratio of starter to dough is pretty high in this recipe. That means that it will rise pretty quickly; much closer to the rising time for commercially yeasted bread. For this recipe I was looking more for a natural leavening agent than for sourness. If you are looking for a true sourdough loaf, this is not the one you want to make. 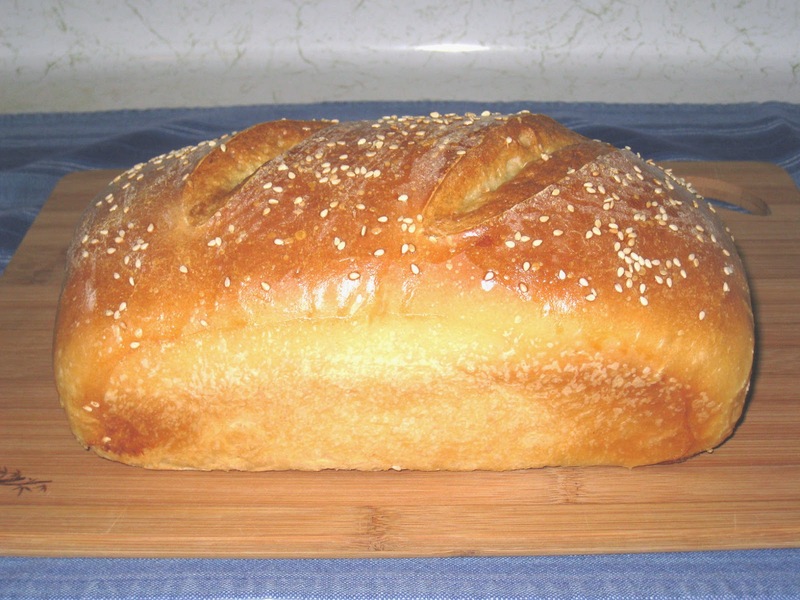 This recipe is for a plain old-fashioned loaf of sandwich bread. You can find information on how to build your own sourdough starter here. Combine the starter, water and flour to make the sponge and let proof from one hour to overnight. When ready to make the bread add the oil, sugar and salt to the sponge and mix well. Add the flour a half cup at a time, stirring with a wooden spoon after each addition until you have a shaggy dough. You may not need all of the flour. Turn the dough out onto a lightly-floured surface and start kneading it, adding flour as needed to keep the dough from sticking. Knead for 10 to 20 minutes to develop the sourdough flavor and the gluten. When it is smooth and elastic and passes the windowpane test* it is done. Form the dough into a ball and place it top side down in a lightly oiled bowl, then turn it over to make sure it is completely covered with the oil. At this point you can cover the bowl with plastic wrap and place it in the refrigerator overnight to further develop the sourdough flavor, or you can cover it with a kitchen towel and let it rise until doubled in size, anywhere from one hour to overnight depending on the strength of your starter. If you put the dough in the refrigerator, let it sit out for half an hour to an hour to come to room temperature before the following step. Punch down the dough and knead it about 6 times. Form it into the desired loaf shape and place it either on parchment paper on a baking sheet (for a free-form loaf) or in a greased bread pan. Cover and let it proof until it has at least doubled in size, about an hour to an hour and a half. About half an hour in, turn on the oven to 350° F. Combine the egg with the water and beat well. When the dough is ready, score it if necessary (depending on the shape of your loaf). Brush the top of the loaf with the egg wash. Lightly sprinkle with the sesame or poppy seeds if you are using them. Bake for 45 minutes to an hour, until the top is golden and the bottom sounds hollow when you tap on it. Remove from the oven and take the bread out of the pan and let it cool on a wire rack for at least an hour before serving. *Take some of the dough and stretch it between your fingers until it is thin enough that you can see through it. If it tears, it is not ready.